In Southeast Europe the automotive industry is presented by two subsectors – motor vehicle manufacture and automotive components manufacture. The first subsector encompasses the production of passenger cars, buses and trucks and is present in Romania, Slovenia, Serbia and Bulgaria. Automotive components are manufactured in the above-mentioned countries and in Croatia, Macedonia and Bosnia and Herzegovina. 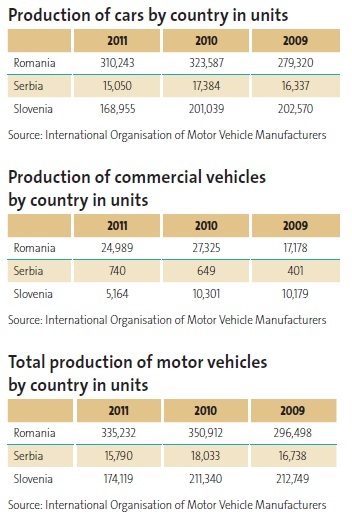 Romania, Slovenia and Serbia reported a decrease of their motor vehicle output in 2011 compared to the previous year due to a drop in demand on most European markets. The steepest decline was reported in Serbia – 17.6%, Slovenia followed with 12.4% and Romania with 4.5%. The launch of new manufacturing facilities in Bulgaria and Serbia in 2012 is expected to give a boost to the sector. Automobile plants usually group a large number of automotive suppliers at the same location or in the vicinity, contributing enormously to the economy of regions and countries. The high potential for import substitution related to the increase in motor vehicles production in Southeast Europe remains one of the main features of the local automotive component market. New players are expected to enter this market following the arrival of new passenger car manufacturers. Opportunities for the automotive components sector include above all investment in R&D centres, increasing the role of national automotive clusters or the possible creation of international and regional clusters. Tucked between western Europe, Russia and the Middle East, the region of Southeast Europe offers automotive manufacturers and suppliers a potential strategic advantage in terms of transportation. Although the volume of the second-hand automobile market is significant in SEE, our analysis is concentrated on the sales and registrations of new motor vehicles only as the best indicator for market development. In 2011 the EU-27 market of new passenger cars declined for a fourth year running, contracting by 1.7% to 13.1 million units. 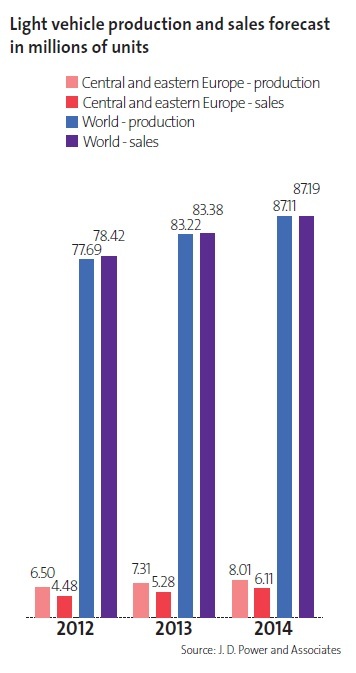 For 2012, international consulting company IHS forecasts another fall in the EU-27 new cars market, by 6.1%. In 2011, Bulgaria recorded the fourth highest year-on-year increase in new passenger car registrations in the European Union – a hefty rise of 22.3% – primarily as a result of the stable macroeconomic environment in the country. In the same year Romania registered the fourth most severe annual drop in new car registrations in the EU-27, by 13.6%. According to data from automotive organisations and the statistical institutes in the SEE countries, total sales in the region (no data available for Albania and Kosovo) fell to 265,845 cars in 2011 from 292,349 in 2010. Motor vehicle sales in the region moved in opposite directions in the different countries in 2011 compared to 2010. The largest year-on-year increase was registered in Moldova (25%), followed by Bulgaria (19.8%) and Croatia (7.7%). The negative record was set by Macedonia where new car sales in 2011 were 38% lower than in 2010. Other significant drops were marked in Romania (23%) and Serbia (18.3%). Automotive industry has historically been among the leading sectors of the Romanian economy. The local association of automotive manufacturers Asociatia Constructorilor de Automobile din Romania (ACAROM) estimates a 10% share of the automotive industry in Romania’s GDP in each of 2010 and 2011, or more than 9.0 billion euro. 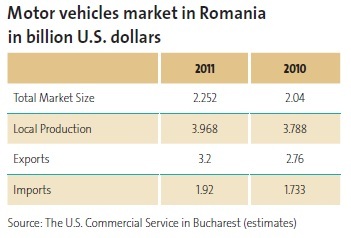 In 2010 automobiles accounted for 18% of Romania’s exports, while the expected figure for 2011 is 20%. Romania is the biggest producer of automobiles in the region. The country is home to two car plants – Dacia is manufactured in Mioveni, in central Romania, and Ford in Craiova, in southwestern Romania. More than 310,000 passenger cars were manufactured in 2011. Romania’s car production per 1,000 inhabitants is among the lowest in the European Union – 16 vehicles compared to 36 on average in EU-27 in 2011. Total motor vehicle production in Romania is expected to rise to 469,800 units in 2012 and 569,100 units in 2015, according to international consultants CSM Worldwide Automotive Forecasting. The Renault subsidiary sold 343,233 units worldwide in 2011. Dacia Duster was the bestselling model with 47% of all Dacia sales. On the domestic market, Dacia sold 30,867 vehicles giving it a market share of 28.9%. Dacia Logan was the most widely sold model in 2011 with a 21.3% market share. Dacia exported 91.5% of its production, or 312,000 vehicles, 240,470 of which in Europe. France is the top export destination for Dacia with 94,278 units sold (3.5% of the French car market in 2011 according to company estimates). Other major foreign markets in 2011 included Germany with 43,452 units sold, Italy with 26,838, Turkey with 21,339 and Algeria with 19,242. The plant has an installed capacity of 350,000 cars per year. In 2010 its staff numbered more than 13,800. In March 2008 Ford Motor Company took over the former Daewoo plant in Craiova. Production of Ford models in the new plant with a capacity of 300,000 vehicles per year started in September 2009. In 2011 the number of employees exceeded 3,500. Total investment as of June 2012 amounted to 675 million euro. By 2013 the annual output capacity of the plant will rise to 350,000 units. Exports are estimated at more than 90% of the output. Three Ford models are assembled in the plant – B-Max and the light commercial vehicles Transit and Transit Connect. In 2010 the Romanian exports of automotive components rose by 30% from the previous year to 2.0 million US dollars. The country acts as an industrial hub in the region with easy access to major markets such as Russia, Poland, Ukraine and Turkey. Expectations for the period 2012-2015 are that demand for automotive components in Romania, central and Southeast Europe will increase. Major automotive components manufactured in Romania include electric and electronic systems, tyres, cables, steering wheels, gear boxes, safety systems, car seats, upholstery, etc. The leading automotive suppliers in Romania are Autoliv Romania (safety systems), Continental Automotive Products (tyres), Takata-Petri (safety systems) and Schaeffler Romania (car parts). The car ownership rate in the region is still much lower than in western and central European markets. The potential for development of the automotive manufacturing industry is higher in Romania than in most central and eastern European countries. Passenger car production per capita in Romania is one-tenth of the figure in Slovakia and a third of the figure in Hungary. The concentration on rolling out no-frills cars allows Romania to aim at two growing market segments at the same time: customers in the neighbouring states and other emerging markets with lower incomes; and customers in western Europe with a preference for budget cars, who form a rapidly growing group in the recent years. Threats to the sectors’s development can arise from a possible abandonment of the car scrappage programme implemented by the state if the macroeconomic situation worsens. 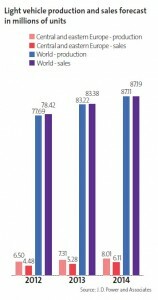 The Romanian new passenger cars market shrank by 23% to 81,709 automobiles in 2011 Dacia suffered an above-average drop but its top position remained unchallenged. The roots of the Slovenian automotive industry reach back to the period between the First and the Second World War when buses were manufactured in Ljubljana. Passenger car production started in 1959 in Novo Mesto, in southeastern Slovenia. Cars under the Renault brand have been manufactured there since 1972. The factory is operated by Revoz d.d. and produces an average of 200,000 cars a year. Since February 2004 the company is wholly owned by Renault s.a.s. France. In 2011 Revoz, the sole Slovenian motor vehicles manufacturer, produced 174,127 automobiles, down from 211,493 in 2010. Revoz currently makes three Renault models – Twingo (141,739 cars produced in 2011), Clio II (26,773 cars) and Wind (5,615 cars). According to Revoz’ estimates, the company will manufacture 160,000 vehicles in 2012. The company exports almost 100% of its output. Top export destinations are France, Germany and the UK. In 2011 Revoz sold on the domestic market only 1,304 Clio IIs and 485 Twingos. According to Eurostat and ACEA, in 2011 Slovenia was the third largest producer of automobiles per 1,000 inhabitants in the European Union with 100 cars, after Slovakia and the Czech Republic. The government provides financial support to the development of new technologies in the automotive sector. Increasing technology competence is seen as the only way for Slovenian automotive producers and suppliers to gain competitive advantage over the low-cost destinations in the region. The Slovenian new vehicles market performed with minor fluctuations in the last three years. The market growth potential in Slovenia is substantially lower than that of the other countries in Southeast Europe given the small population combined with high car penetration rate. In 2011, the year-on-year decrease in the sales of light vehicles in Slovenia was 1.4%. Volkswagen was the only brand in the Top 5 to register an increase in sales, almost closing the gap to the leader Renault. According to local automotive association Avto Drustvo Slovenije, the bestselling model in 2011 was Renault Clio with a 6.5% market share. Manufacturing of automotive components is still lagging behind automobiles production in Slovenia but has an immense growth potential. More than 90 companies with 24,800 employees are involved in this sector. Cars and auto-components traditionally account for more than 20% of Slovenian exports. Here one should mention leading Slovenian company CIMOS, which supplies braking systems to car makers in western Europe. The Automotive Cluster of Slovenia has 59 members, including technical universities and research and development centres. The organisation ensures vertical and horizontal integration, as well as effective communication between manufacturers, research organisations and the government. Automobile manufacturing in Serbia began soon after the World War II. In 1953 FAP Priboj started making trucks and buses. In 1954 FIAT started assembling cars in Kragujevac, in central Serbia. Later the factory produced Zastava and Yugo brands under FIAT licence and trucks under Iveco licence. In 2008 FIAT Automobili Srbija was established as a 67/33 joint venture of Italy’s FIAT Group Automobiles S.p.A and the Serbian state. Since April 2009 the company has been rolling out the passenger car Fiat Punto Classic. In April 2012 FIAT launched its modernised factory in Kragujevac at the same site where it manufactured Zastava cars from 1954 to 2008. The production of the new model FIAT 500L will begin in the fourth quarter of 2012. The capacity of the plant is 160,000 units per year. More than 2,400 employees will work at the plant by the end of 2012. The output will be sold on the domestic market, in Italy and other European countries. FIAT’s investment was backed by financial aid provided by the Serbian government. According to Serbian state investment agency SIEPA, motor vehicle production accounted for 12% of the total automotive industry turnover of 929 million euro in 2011, up from 838 million euro in 2010 and 646 million euro in 2009. The remainder is formed by automotive components production, in which 26 companies are engaged. Tyres and suspension parts make up 32% of the automotive industry turnover, followed by electrical system components with 22% and engine components with 13%. The leading companies in the components sector in terms of total investment are Tigar Tyres d.o.o. with 150 million euro, CIMOS a.d. with 120 million euro and Robert Bosch a.d. with 72 million euro. The new passenger car market in Serbia recorded an 18.3% year-on-year fall to 31,770 vehicles sold in 2011 against 38,900 in 2010. Despite a slump of 60% in sales, FIAT retained its leading position, closely followed by Skoda which was the only brand among the Top 5 in Serbia to grow in 2011. The country’s first automotive factory, in which buses and cars were assembled on imported chassis of Fiat and Daimler Benz, was opened in 1924 in Botevgrad, in western Bulgaria. Later the plant produced buses under the brand Chavdar, using engines and gearboxes produced by Skoda. Between 1965 and 1990 Russian-designed Moskvitch passenger cars were assembled in Lovech, in central Bulgaria. From 1967 to 1971 Pirin-FIAT was assembled in Lovech under the licence of FIAT. In 1966 Renault started assembling passenger cars in Plovdiv, in southern Bulgaria, under the brand Bulgarrenault. Trucks under the Madara brand were produced in Shumen, in northeastern Bulgaria. The last attempt of Bulgaria to produce cars before China’s Great Wall company arrived in 2012 was in Varna, in northeastern Bulgaria, where Rover Maestro was assembled before production collapsed within a year from its launch in 1996. In February 2012, Great Wall opened a factory in Lovech, its first production site for Chinese-made automobiles in the European Union. The assembly plant of Great Wall and its Bulgarian partner Litex Motors will have a production capacity of 50,000 cars a year. It will assemble four models: two passenger car models – Voleex C10 and Voleex C30 (still not in production), a pickup truck – Steed and a SUV – Hover H5. According to Business Monitor International, full capacity will not be reached before 2016, when 32,600 units are expected to be assembled. Initially, Great Wall plans to sell its cars assembled in Lovech in Bulgaria, Serbia and Macedonia. As of February 2012 total investments in the factory amounted to 30 million euro and its workforce numbered 120. They are expected to increase to 2,000 when full capacity is reached within three to five years. The company plans to assemble 2,000 motor vehicles in 2012. Great Wall sold 516 cars in Bulgaria in the first half of 2012 which gave it a market share of 4.3%. The success of the Great Wall venture in Bulgaria is critical to the future of the Bulgarian automotive industry. Success means Bulgaria may soon become a booming site for Chinese car production in the European Union. Bulgaria, a member of the EU since 2007, was chosen by the Chinese manufacturer as a bridgehead for its expansion on European markets as cars produced in Lovech will be eligible for duty-free sales in the other 26 countries of the bloc. The market potential of Bulgaria is higher than that of Slovenia but lower than that of Romania, Serbia and Croatia. Bulgaria is one of the five large markets in the region but its relatively high rate of car ownership (632 vehicles per 1,000 people) compared to the SEE average, the very low number of new vehicle registrations and the dominance of aftermarket dent its attractiveness. More than 30 auto-components producers with 15,000 employees operated in Bulgaria in 2012. Their total turnover in 2011 exceeded 750 million euro. Among the leading automotive suppliers are: Sensor-Nite, which makes temperature sensors for Volkswagen Group, KIA and Hyundai; cable producer SE Bordnetze Bulgaria; Yazaki Bulgaria, which makes cables for Renault; Integrated Micro-Electronics Bulgaria, a producer of electronics for BMW, Mercedes, FIAT; Montupet, a manufacturer of aluminium components for Audi, BMW, Ford, Dacia and Volvo, and Johnson Controls, which makes software for automobile electronics. Most of their production activities are export-driven. With the entrance of Great Wall Motors in Bulgaria the local component sector is expected to gain momentum and possibly attract other foreign investors. According to the government’s investment promotion agency, the production of components for the automotive industry was one of the two sectors that attracted most FDI to the Bulgarian economy in 2009, 2010 and 2011. The trend, however, is for a drop of investments in components production. One reason is that operational production capacities in Europe are more than enough to satisfy demand for components. Many companies in the sector are trying to find alternative use of their facilities in order to keep their staff. According to the newly established Automotive Cluster Bulgaria, the most important reasons for investment in this sector are the lower labour costs as compared to those in central Europe, low taxes, qualified workforce, proximity to automobile plants in Bulgaria, Romania, Serbia and Turkey, flexibility and work on clients’ demand. Threats to the sector’s development can arise above all from the extremely weak domestic demand and from strong competition in the neighbouring countries – Romania, Turkey, Serbia. In 2011 automobile sales in Bulgaria showed fast recovery after the slump in 2010. For 2012 Business Monitor International projects a 3.5% growth in new car sales. New passenger car sales rose to 22,550 units in 2011 from 18,820 a year earlier. Competition at the top of the brands’ ranking remains intense. Volkswagen enjoyed a 33% increase in sales and climbed to the top from the fourth place in 2010. Ford lost its leading position and dropped to the second position, closely followed by Toyota, Opel and Peugeot. The best-selling model in the first six months of 2012 were Dacia’s Logan and Sandero models, with a combined market share of 5.2%. In 2011 the automotive industry in Bosnia and Herzegovina was represented by production of parts and components – engines, gearboxes, metal precision parts, drive shafts, brake parts and systems, clutches, steering parts and systems, electric parts, aluminium wheels and seat covers. More than 90% of the output was exported to 30 countries. The main export destinations were Germany, Italy, Slovenia, Serbia, Croatia and Sweden. The leading investor was Volkswagen which operates a production plant for various Volkswagen, Audi and Skoda parts and components. Until 1992 passenger cars were assembled in the Volkswagen plant in Sarajevo. According to data from Bosnian automobile club BIHAMK, 44,249 new passenger cars, 4,429 trucks and 187 buses were registered in Bosnia and Herzegovina last year. 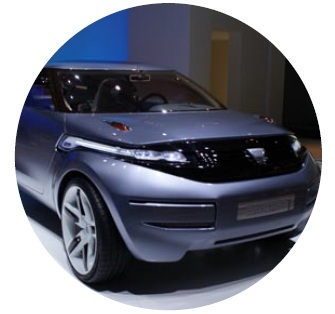 The automotive industry is represented solely by automotive components manufacturing. The most important players in the industry are members of the Croatian Automotive Cluster which comprises 50 companies with a total of 6,000 employees. Their combined turnover was 420 million euro in 2010. Leading automotive components producers in Croatia include CIMOS, Yazaki, Boxmark Leather and AD Plastik. More than 90% of the automotive sector production was exported last year to Germany, Austria, Italy, France and other European countries for clients like Volkswagen Group, Ford, Opel, BMW and Renault. Croatia exports mainly electronic components, safety systems, braking systems, seats and steering wheels. In 2011 passenger car sales in Croatia increased by 7.7% from 2010 to 41,560 units. Volkswagen reported a sound 20% growth and snatched the title of most popular brand from Opel. Sales of Skoda increased most. Macedonia lacks automobile assembly plants but automotive components manufacturing is regarded by the government as one of the priority economic sectors. The third largest Macedonian company in terms of total revenue in 2011 was automotive components producer Johnson Matthey DOOEL, according to local daily Kapital. Among the main product groups manufactured in Macedonia are seat belts, car parts, electric batteries, printed circuits and clutches. World Trade Organisation figures show that most exports of automotive components go to Russia (27%), followed by Serbia (23%), Slovenia (16%), Germany (12%) and Croatia (6%). Proximity to automobile production sites in Serbia, Bulgaria, Romania and Turkey is seen as the main driver of the automotive components industry in Macedonia, together with the cheap, yet well educated workforce. As far as new motor vehicle sales are concerned, Macedonia was the country in the deepest crisis in the whole region. 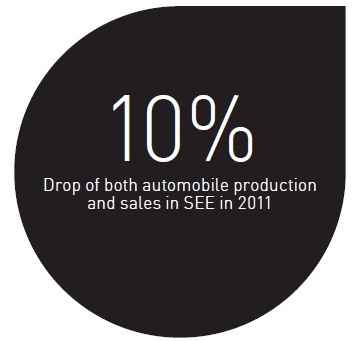 In 2011, sales dropped by 38% from 2010 and were equal to less than a third of the peak performance in 2008. The new passenger car market in SEE remained dominated by European manufacturers last year led by a local brand. Despite the 22% year-on-year drop in sales, in 2011 Dacia maintained its position as the most widely bought brand in Southeast Europe (excl. Albania, Kosovo, Macedonia and Montenegro), followed by Volkswagen and Renault. The main reason for this leading position was the dominant share of Dacia in Romania (by far the largest market in Southeast Europe), supported by high shares on the Serbian, Bulgarian and Moldovan markets. Volkswagen and Skoda were the only brands in the Top 5 to increase their sales in 2011. Volkswagen outperformed Renault and occupied the second position in terms of sales in SEE. Ranking among the Top 3 brands in Romania, Slovenia, Croatia, Bulgaria and Bosnia and Herzegovina, the German giant is the most evenly distributed top brand in the region. In 2012 the growth rates of the global automotive industry are expected to remain low. A slowdown can be felt in western Europe and North America, while emerging markets like Southeast Europe, may show recovery due above all to lower car density and higher growth potential. International business advisory company PricewaterhouseCoopers expects a 10% rise in global light motor vehicles production in 2012. The major strengths, on which all hopes for development of the automotive industry in the region rest, include low production costs, skilled workforce and strategic location between significant markets such as western Europe, Russia and the Middle East. There are, however, a number of challenges. It will take a long time to turn around the current downward cycle in the passenger car market, even if consumer confidence and fiscal stability in Europe improve. In addition, there is no local car manufacturer in the region – all plants in SEE are operated by subsidiaries of global companies. Thus, local industry remains vulnerable to decisions of global manufacturers which plants to develop and retain and which to close down or move to other countries. The rapid development of the automotive industry in several countries in central and Southeast Europe in the last two decades inspired others in the region to learn from their experience and join the race. For example, Serbia has announced they wanted to copy Slovakia by attracting European investment to their automotive industry and declaring the latter a top priority sector. Bulgaria and Romania have also launched new production plants and aim to turn the whole region into a strategic zone for automotive manufacturers and suppliers. The SEE region will undoubtedly remain important for years to come, as international producers continue to choose SEE as a place for new investment despite the recent economic turmoil. In the medium to long run, changes are possible in the positions of the individual countries within the region as a result of investments in new automobile production facilities.